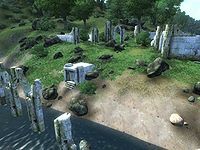 Nenalata is a medium-sized Ayleid ruin east of Bravil containing undead (quest-related). It contains three zones: Nenalata, Nenalata Wendesel, and Nenalata Sel Aran Arpena. Nenalata is the ruined capital of the last surviving Ayleid kingdom. A section of Nenalata Sel Aran Arpena is inaccessible until you start the Secrets of the Ayleids quest. 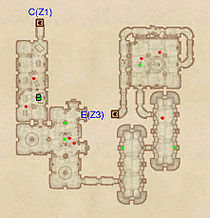 Specifically, this concerns the throne room past a hidden door (marked with 'I' on the map). This issue has been addressed by the Unofficial Oblivion Patch; it removes the extra entry from the leveled list. 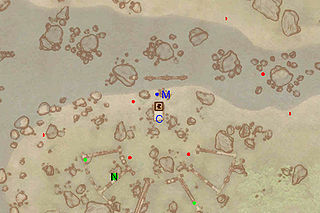 The map for Nenalata Wendesel is incorrectly rotated in-game. When you leave Nenalata, you will be facing west; when you enter Nenalata Wendesel, you will be facing south. This bug is fixed by version 3.1.0 of the Unofficial Oblivion Patch. This location's map marker (M on map) is named Nenalata (editor name NenalataMapMarker). The entrance door is SSE of the marker, 20 feet away. You enter this zone from door Out and exit it through door C to Nenalata Wendesel. Accesss to door D to Nenalata Sel Aran Arpena is blocked by gate H, which is opened by pressing a push block (cyan dot on map) that is unfortunately located on the other side. 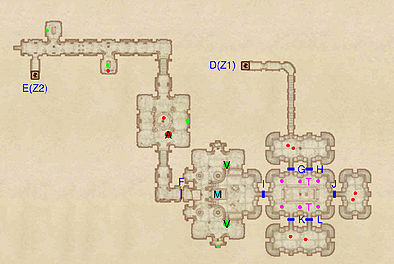 The second room that you enter holds all eight of this zone's Welkynd Stones. In the third, smaller room encountered you will find the boss chest (B), which is well hidden between a couple of fallen stone blocks. In the next corridor you will come across gate F, which will open once you are close enough. The Hidden Door at G also opens once you are close enough to reveal two enemies and a minor loot chest. In the next room, along with two enemies, you will find door C, which leads to the next level. 8 Welkynd Stones, all located on easily-reachable pedestals in the second, rectangular-shaped room. In the first room that you enter from door C you will face two enemies that are guarding the boss chest at B. Due to the particular form of this room, with half-sections criss-crossing the chamber, it is possible to deal with the two undead separately. In the second room that you enter are this level's three Welkynd Stones. Battle your way through the next two rooms to reach door E leading to Nenalata Sel Aran Arpena. 3 Welkynd Stones, all located in the second room you enter, high up on their pedestals. See the stones' page for tips on how to reach them. Sel Aran Arpena roughly translates into "Hall of the Noble King." 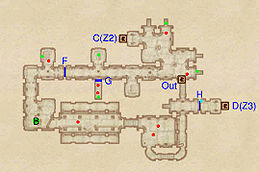 After entering from door E, in the first large room you will find the boss-level undead (A) and another enemy. Gate F will open once you are close enough to reveal another large room containing two Welkynd Stone, two Varla Stones (V) and a minor loot chest. The stone steps at M are already activated and will lead you to a lower level of the room. If you are exploring this ruin prior to the related quest, you are at a dead end. 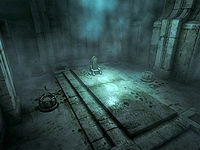 If not, Umbacano will position the stone carving you gained for him in the previous quest inside a niche. At this point the Hidden Door at I will disappear into the ceiling to reveal a room with a throne in the middle and six inactive Dark Welkynd Traps (T). 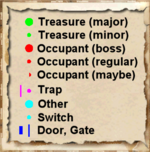 Whichever way the related quest plays out, the four wall panels at G, H, J, and L and the hidden door at K will open and six undead will be unleashed against you. Fleeing is a very viable option here, especially at higher levels. Don't try to escape from where you came because the stone steps have retreated. Instead, enter the room on the left and run up a long set of stairs until you reach door D, which will take you directly back to the entrance of this ruin.